Propaganda map emphasizing the importance of Alaska in the fight against Japan. Alaska: Springboard for Our Attack Upon Japan! The bottom map is a specific map of Alaska. This map depicts the region from Asia (Russia – U.S.S.R.) to the Klondike and from the Arctic Ocean to the Pacific Ocean. Numerous locations throughout Alaska are labeled, including Anchorage, Juneau, Seward, and Point Barrow. The Brooks Range, the Alaska Range, the Sischu Mountains, and the Cugach Mountains are also labeled. Several text boxes inform the Sunday Tribune's readers about the importance of Alaska, such as that it contains the only tin deposits in the United States and that forests on the Alaska panhandle could supply one quarter of the United States' newsprint perpetually. 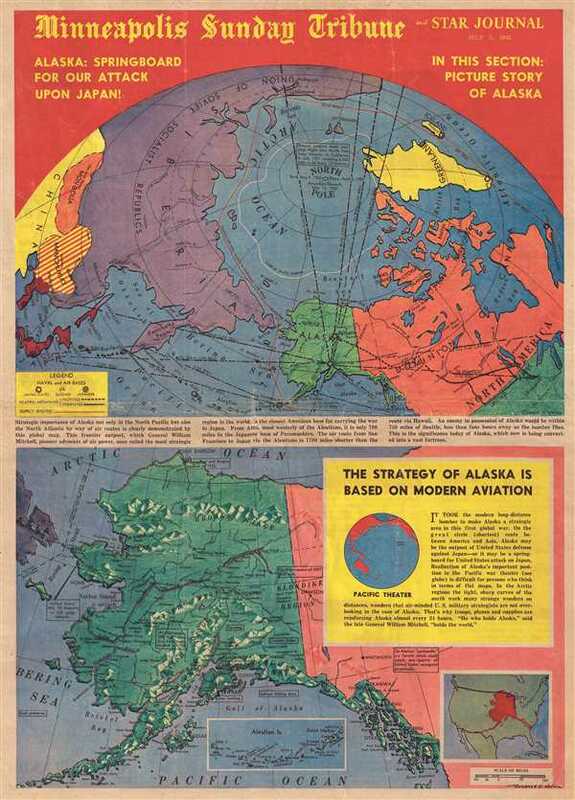 A text box, entitled, 'The Strategy of Alaska is Based on Modern Aviation' discusses the concept of the 'great circle' routes in aviation and that arctic air travel routes are shorter dur to the 'tight, sharp curves of the earth' closer to the pole. A small inset map superimposes Alaska over the continental United States, providing an idea of the relative size of the state versus the continental U.S. These two maps were created by Warner S. Nelson of the Minneapolis Star and printed by the Minneapolis Sunday Tribune and Star Journal on July 5, 1942. The Minneapolis Tribune (1867 - present) was founded by Colonel William S. King, William D. Washburn, and Dorilus Morrison and the first issue was published on May 25, 1867. In 1941, the Cowles family of Des Moines, Iowa bought the Tribune and merged it with their other holdings in Minneapolis, giving the Cowles family ownership of all the city's major newspapers. The Tribune became the city's morning newspaper, and the Star-Journal was the evening newspaper. The two published a joint Sunday edition. The newspaper is still published today, under the name Star Tribune. Good. Newsprint. Wear along original centerfold. Even overall toning. Closed tear extending 1.25 inches in center professionally repaired on verso. Closed margin tears professionally repaired on verso. Printed photographs and text on verso.